Chatsworth House is a stately home in Derbyshire, England, in the Derbyshire Dales 3.5 miles (5.6 km) northeast of Bakewell and 9 miles (14 km) west of Chesterfield (SK260700). The seat of the Duke of Devonshire, it has been home to the Cavendish family since 1549. Trustees of the Chatsworth Settlement, who lease the house to the Chatsworth House Trust. Standing on the east bank of the River Derwent, Chatsworth looks across to the low hills that divide the Derwent and Wye valleys. The house, set in expansive parkland and backed by wooded, rocky hills rising to heather moorland, contains an important collection of paintings, furniture, Old Master drawings, neoclassical sculptures, books and other artefacts. 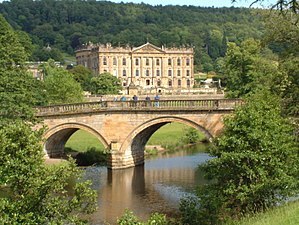 Chatsworth has been selected as the United Kingdom's favourite country house several times. The name 'Chatsworth' is a corruption of Chetel's-worth, meaning "the Court of Chetel". In the reign of Edward the Confessor, a man of Norse origin named Chetel held lands jointly with a Saxon named Leotnoth in three townships: Ednesoure to the west of the Derwent, and Langoleie and Chetesuorde to the east. Chetel was deposed after the Norman Conquest and in the Domesday Book the Manor of Chetesuorde is listed as the property of the Crown in the custody of William de Peverel. Chatsworth ceased to be a large estate, until the 15th century when it was acquired by the Leche family who owned property nearby. They enclosed the first park at Chatsworth and built a house on the high ground in what is now the south-eastern part of the garden. In 1549 they sold all their property in the area to Sir William Cavendish, Treasurer of the King's Chamber and the husband of Bess of Hardwick, who had persuaded him to sell his property in Suffolk and settle in her native county. Bess began to build the new house in 1553. She selected a site near the river, which was drained by digging a series of reservoirs, which doubled as fish ponds. Sir William died in 1557, but Bess finished the house in the 1560s and lived there with her fourth husband, George Talbot, 6th Earl of Shrewsbury. In 1568 Shrewsbury was entrusted with the custody of Mary, Queen of Scots, and brought his prisoner to Chatsworth several times from 1570 onwards. She lodged in the apartment now known as the Queen of Scots rooms, on the top floor above the great hall, which faces onto the inner courtyard. An accomplished needlewoman, Bess joined Mary at Chatsworth for extended periods in 1569, 1570, and 1571, during which time they worked together on the Oxburgh Hangings. Bess died in 1608 and Chatsworth was passed to her eldest son, Henry. The estate was purchased from Henry by his brother William Cavendish, 1st Earl of Devonshire, for £10,000. Few changes were made at Chatsworth until the mid-17th century. William Cavendish, 3rd Earl of Devonshire was a staunch Royalist and was expelled from the House of Lords in 1642. He left England for the safety of the continent and his estates were sequestrated. Chatsworth was occupied by both sides during the Civil War, and the 3rd Earl did not return to the house until the restoration of the monarchy. He reconstructed the principal rooms in an attempt to make them more comfortable, but the Elizabethan house was out-dated and unsafe. The 4th Earl of Devonshire, who was to become the 1st Duke in 1694 for helping to put William of Orange on the English throne, was an advanced Whig and was forced to retire to Chatsworth during the reign of King James II. This called for a rebuilding of the house, which began in 1687. Cavendish initially planned to reconstruct only the south wing with the State Apartments, so he decided to retain the Elizabethan courtyard plan, despite the fact that this layout was becoming increasingly unfashionable. He enjoyed building and reconstructed the East Front, that included the Painted Hall and Long Gallery, followed by the rebuilding of the West Front from 1699 to 1702. The North Front was completed in 1707 just before the Duke died. The 1st Duke also had large parterre gardens designed by George London and Henry Wise, who was later appointed by Queen Anne to the post of Royal Gardner at Kensington Palace. William Cavendish, 2nd Duke of Devonshire, and William Cavendish, 3rd Duke of Devonshire, made no changes to the house and gardens, but both contributed greatly to the collection found at Chatsworth to this date. Connoisseur of the arts the collection include paintings, Old Master drawings and prints, ancient coins and carved Greek and Roman sculptures. Palladian furniture designed by William Kent was commissioned by the 3rd Duke when he had Devonshire House in London rebuilt following a fire in 1733. Upon the sale and demolition of Devonshire House in 1924 the furniture was transferred to Chatsworth. The 4th Duke made great changes to the house and gardens. He decided the approach to the house should be from the west and had the old stables and offices as well as parts of Edensor village pulled down so they were not visible from the house. He also replaced the 1st Duke's formal gardens with a more natural look, designed by Lancelot "Capability" Brown, which he helped bring into fashion. In 1748, the 4th Duke married Lady Charlotte Boyle, the sole surviving heiress of Richard Boyle, 3rd Earl of Burlington. Lord Burlington was an accomplished architect in his own right with many works to his name including Chiswick House. With his death, his important collection of architectural drawings and Inigo Jones masque designs, Old Master paintings and William Kent designed furniture were transferred to the Dukes of Devonshire. This inheritance also brought many estates to the family. The 6th Duke (known as 'the Bachelor Duke') was a passionate traveller, builder, gardener and collector who transformed Chatsworth. In 1811 he inherited the title and eight major estates; Chatsworth and Hardwick Hall in Derbyshire, Devonshire House, Burlington House and Chiswick House in London, Bolton Abbey and Londesborough Hall in Yorkshire, and Lismore Castle in Ireland. These estates covered 200,000 acres (810 km2) of land in England and Ireland. The Duke was a great collector especially of sculpture and books. When he built the North Wing he had a purpose built Sculpture Gallery to house his collection and repurposed numerous rooms in the house to contain the entire libraries he would purchase at auction. The 6th Duke loved to entertain and the early 19th century saw a rise in popularity of the 'English Country House Party,' and so in 1830 the Duke converted rooms on the east side of the house into guest bedrooms. People invited to stay at Chatsworth spent their days hunting, riding, reading and playing billiards. In the evening formal dinners would take place followed by music, charades and smoking for the men. Women would return to their bedroom many times during the day to change their outfits. These guest bedrooms at Chatsworth are the most complete set of bedrooms from the period to survive with their original furnishings. :52 There is much eastern influence in the decoration including hand-painted Chinese wallpapers and fabrics which are typical of Regency Taste, which developed during the reign of George IV (1762–1830). People who have stayed at Chatsworth include Queen Victoria and Charles Dickens. In October 1832, Princess Victoria (later Queen Victoria) and her mother, the Duchess of Kent, visited Chatsworth where she had her first formal adult dinner, at the age of 13, in the new dining room. The 6th Duke had another opportunity to welcome Victoria in 1843 when the Queen and Prince Albert returned to be entertained by a large array of illuminated fountains. The Duke spent 47 years transforming the house and gardens. A Latin inscription over the fireplace in the Painted Hall translates as, "William Spencer, Duke of Devonshire, inherited this most beautiful house from his father in the year 1811, which had been begun in the year of English liberty 1688, and completed it in the year of his bereavement 1840". 1688 was the year of the Glorious Revolution, supported by the Whig dynasties including the Cavendishes. The year 1840 saw the death of the Duke's beloved niece Blanche, who was married to his heir, the future 7th Duke. In 1844 he published a book called Handbook to Chatsworth and Hardwick. In the early 20th century social change and taxes began to affect the Devonshires' lifestyle. When the 8th Duke died in 1908 over £500,000 of death duties became due. This was a small charge compared to what followed forty-two years later, but the estate was already burdened with debt from the 6th Duke's extravagances, the failure of the 7th Duke's business ventures at Barrow-in-Furness, and the depression in British agriculture that had been apparent since the 1870s. In 1912 the family sold 25 books printed by William Caxton and a collection of 1,347 volumes of plays acquired by the 6th Duke, including four Shakespeare folios and 39 Shakespeare quartos, to the Huntington Library in California. Tens of thousands of acres of land in Somerset, Sussex and Derbyshire were also sold during, and immediately after, World War I. In December 1904, King Charles I of Portugal and Queen Maria Amélia stayed at Chatsworth House during their visit to Great Britain. It snowed almost constantly while they were there, and the King reportedly started a snowball fight (in which the assembled ladies enthusiastically joined) when he met the Marquis of Soveral, the Portuguese Envoy Extraordinary and Minister Plenipotentiary to the Court of St James's. In 1920 the family's London mansion, Devonshire House, which occupied a 3-acre (12,000 m2) site on Piccadilly, was sold to developers and demolished. Much of the contents of Devonshire House was moved to Chatsworth and a much smaller house at 2 Carlton Gardens near The Mall was acquired. The Great Conservatory in the garden at Chatsworth was demolished as it needed 10 men to run it, huge quantities of coal to heat it, and all the plants had died during the war when no coal had been available for non-essential purposes. To further reduce running costs, there was also talk of pulling down the 6th Duke's north wing, which was then regarded as having no aesthetic or historical value, but nothing came of it. Chiswick House—the celebrated Palladian villa in the suburbs of West London that the Devonshires inherited when the 4th Duke married Lord Burlington's daughter—was sold to Brentford Council in 1929. Nonetheless, life at Chatsworth continued much as before. The household was run by a comptroller and domestic staff were still available, although more so in the country than in the cities. The staff at Chatsworth at this time consisted of a butler, under butler, groom of the chambers, valet, three footmen, a housekeeper, the Duchess's maid, 11 housemaids, two sewing women, a cook, two kitchen maids, a vegetable maid, two or three scullery maids, two stillroom maids, a dairy maid, six laundry maids and the Duchess's secretary. All of these 38 or 39 people lived in the house. Daily staff included the odd man, upholsterer, scullery-maid, two scrubbing women, laundry porter, steam boiler man, coal man, two porter's lodge attendants, two night firemen, night porter, two window cleaners, and a team of joiners, plumbers and electricians. The Clerk of Works supervised the maintenance of the house and other properties on the estate. There were also grooms, chauffeurs and gamekeepers. The number of garden staff was somewhere between the 80 of the 6th Duke's time and the 20 or so of the early 21st century. There was also a librarian, Francis Thompson, who wrote the first book-length account of Chatsworth since the 6th Duke's handbook. Most of the UK's country houses were put to institutional use during World War II. Some of those used as barracks were badly damaged, but the 10th Duke, anticipating that schoolgirls would make better tenants than soldiers, arranged for Chatsworth to be occupied by Penrhos College, a girls' public school in Colwyn Bay, Wales. The contents of the house were packed away in 11 days and, in September 1939, 300 girls and their teachers moved in for a six-year stay. The whole of the house was used, including the state rooms, which were turned into dormitories. Condensation from the breath of the sleeping girls caused fungus to grow behind some of the pictures. The house was not very comfortable for so many people, with a shortage of hot water, but there were compensations, such as skating on the Canal Pond. The girls grew vegetables in the garden as a contribution to the war effort. The modern history of Chatsworth begins in 1950. The family had not yet moved back after the war and, although the 10th Duke had transferred his assets to his son during his lifetime in the hope of avoiding death duties, he died a few weeks too early for the lifetime exemption to apply, and tax was charged at 80% on the whole estate. The amount due was £7 million (£236 million as of 2018). Some of the family's advisors considered the situation to be irretrievable, and there was a proposal to transfer Chatsworth to the nation as a Victoria and Albert Museum of Northern England. Instead, the Duke decided to retain his family's home if he could. He sold tens of thousands of acres of land, transferred Hardwick Hall to the National Trust in lieu of tax, and sold some major works of art from Chatsworth. The family's Sussex house, Compton Place was lent to a school. The effect of the death duties was mitigated to some extent by the historically low value of art during the post-war years and the increase in land values, subsequent to 1950, during the post-war agricultural revival, and, on the face of it, the losses were considerably less than 80% in terms of physical assets. In Derbyshire 35,000 acres (140 km2) were retained out of 83,000 acres (340 km2). The Bolton Abbey estate in Yorkshire and the Lismore Castle estate in Ireland remained in the family. Nonetheless, it took 17 years to complete negotiations with the Inland Revenue, interest being due in the meantime. The Chatsworth Estate is now managed by the Trustees of the Chatsworth Settlement, which was established in 1946. The 10th Duke was pessimistic about the future of houses like Chatsworth, and made no plans to move back in after the war. After Penrhos College left in 1945 the only people who slept in the house were two housemaids, but over the winter of 1948–49 the house was cleaned and tidied for reopening to the public by two Hungarian women who had been Kathleen Kennedy's cook and housemaid in London and a team of their compatriots. The house was Grade I listed in 1951, following the passing of the Town and Country Planning Act 1947. In the mid-1950s, the 11th Duke and Duchess began to think about moving into the house. The pre-war house had relied entirely on a large staff for its comforts, and lacked modern facilities. The building was rewired, the plumbing and heating were overhauled, and six self-contained staff flats were created to replace the small staff bedrooms and communal servants' hall. Including those in the staff flats, 17 bathrooms were added to the existing handful. The 6th Duke's cavernous kitchen was abandoned and a new one was created closer to the family dining room. The family rooms were repainted, carpets were brought out of store, and curtains were repaired or replaced. The Duke and Duchess and their three children moved across the park from Edensor House in 1959. In 1981, the trustees of the Chatsworth Settlement, owners of the house, created a new charitable trust, The Chatsworth House Trust. The intention was to preserve the house and its setting for "the benefit of the public." The new trust was granted a 99-year lease; this covered the house, its principal contents, grounds, precincts and adjacent forestry, a total of 1,822 acres (7.37 km2). To legalise the arrangement, the Chatsworth House Trust pays a token rent of £1 a year. To facilitate this arrangement and provide the necessary multimillion-pound endowment fund, the trustees sold works of art, mostly old master drawings, which had not been on regular display. The family is represented on the trust council, but it is composed of a majority of non-family members. The duke pays a market rent for the use of his private apartments in the house. The cost of running the house and grounds is around £4 million a year. The 11th Duke died in 2004 and was succeeded by his son, the current Duke, Peregrine Cavendish, 12th Duke of Devonshire. The 11th Duke's widow, the Dowager Duchess of Devonshire, died on 24 September 2014. Up until her death she was very active in promoting the estate and increasing its visitor income. She was responsible for many additions to the gardens, including the maze, the kitchen, the cottage gardens and several commissions of modern sculpture. She also wrote seven books about different aspects of Chatsworth and its estate. A structural survey in 2004 showed that major renovation to the house was required. A £32 million programme of works was subsequently undertaken, including the restoration of stonework, statues, paintings, tapestries and water features. The work, the most extensive for 200 years, took ten years and was completed in 2018. Chatsworth House is built on sloping ground, lower on the north and west sides than on the south and east sides. The original Tudor mansion was built in the 1560s by Bess of Hardwick in a quadrangle layout, approximately 170 feet (50 m) from north to south and 190 feet (60 m) from east to west, with a large central courtyard. The main entrance was on the west front, which was embellished with four towers or turrets, and the great hall in the medieval tradition was on the east side of the courtyard, where the Painted Hall remains the focus of the house to this day. The south and east fronts were rebuilt under the order of William Talman and were completed by 1696 for William Cavendish, 1st Duke of Devonshire. The 1st Duke's Chatsworth was a key building in the development of English Baroque architecture. According to the architectural historian Sir John Summerson, "It inaugurates an artistic revolution which is the counterpart of the political revolution in which the Earl was so prominent a leader." The design of the south front was revolutionary for an English house, with no attics or hipped roof, but instead two main stories supported by a rusticated basement. The facade is dramatic and sculptural with ionic pilasters and a heavy entablature and balustrade. The existing heavy and angular stone stairs from the first floor down to the garden are a 19th-century replacement of an elegant curved double staircase. The east front is the quietest of the four on the main block. Like the south front it is unusual in that it has an even number of bays and no centrepiece. The emphasis is placed on the end bays, each highlighted by double pairs of pilasters, of which the inner pairs project outwards. The west and north fronts may have been the work of Thomas Archer, possibly in collaboration with the Duke himself. The west front has nine wide bays with a central pediment supported by four columns and pilasters to the other bays. Due to the slope of the site this front is taller than the south front. It is also large, with many other nine-bay three-storey facades little more than half as wide and tall. The west front is very lively with much carved stonework, and the window frames are highlighted with gold leaf, which catches the setting sun. The north front was the last to be built. It presented a challenge, as the north end of the west front projected nine feet (3 m) further than the north end of the east front. This problem was overcome by building a slightly curved facade to distract the eye. The attic windows on this side are the only ones visible on the exterior of the house and are set into the main facade, rather than into a visible roof. Those in the curved section were originally oval, but are now rectangular like those in the end sections. The north front was altered in the 19th century when William Cavendish, 6th Duke of Devonshire, along with the architect Jeffry Wyatville, built the North Wing, doubling the size of the house. Most of this wing only has two storeys, compared to the three of the main block. It is attached to the north-east corner of the house, and is around 400 feet (120 m) long. At the end of the North Wing is the North, or Belvedere, Tower. The work was carried out in an Italianate style that blends smoothly with the elaborate finish of the baroque house. The 6th Duke built a gatehouse at this end of the house with three gates. The central and largest gate led to the North Entrance, then the main entrance to the house. This is now the entrance used by visitors. The north gate led to the service courtyard, and the matching south gate led to the original front door in the west front, which was relegated to secondary status in the Duke's time, but is now the family's private entrance once again. The facades to the central courtyard were also rebuilt by the 1st Duke. The courtyard was larger than it is now, as there were no corridors on the western side and the northern and southern sides only had enclosed galleries on the first floor with open galleries below. In the 19th century, new accommodation was built on these three sides on all three levels. The only surviving baroque facade is that on the eastern side, where five bays of the original seven remain, and are largely as built. There are carved trophies by Samuel Watson, a Derbyshire craftsman who did a lot of work at Chatsworth in stone, marble and wood. The 1st and 6th Dukes both inherited an old house, and tried to adapt to the lifestyle of their time without changing the fundamentals of its layout, making Chatsworth's layout unique, full of irregularities and the interiors a collection of different styles. Many of the rooms are recognisable of one main period, but in nearly every case, they have been altered more often than might be supposed at first glance. The 1st Duke created a richly appointed Baroque suite of state rooms across the south front in anticipation of a visit by King William III and Queen Mary II that never occurred. The State Apartments are accessed from the Painted Hall, decorated with murals showing scenes from the life of Julius Caesar by Louis Laguerre, and ascending the cantilevered Great Stairs to the enfilade of rooms that would control how far a person could progress into the presence of the King and Queen. The Great Chamber is the largest room in the State Apartments, followed by the State Drawing Room, the Second Withdrawing Room, the State Bedroom and finally the State Closet with each room being more private and ornate than the last. The Great Chamber includes a painted ceiling of a classical scene by Antonio Verrio. The Second Withdrawing Room was renamed the State Music Room by the 6th Duke when he brought the violin door here from Devonshire House in London. The door features a very convincing trompe l'oeil of a violin and bow "hanging" on a silver knob, painted around 1723 by Jan van der Vaardt. Around the time Queen Victoria decided that Hampton Court, with its state apartments in the same style, was uninhabitable, the 6th Duke wrote that he was tempted to demolish the State Apartments to make way for new bedrooms. However, sensitive to his family's heritage, he left the rooms largely untouched, making additions rather than change the existing spaces of the house. Changes to the main baroque interiors were restricted to details such as stamped leather hangings on the walls of the State Music Room and State Bedroom, and a wider and shallower, but less elegant staircase in the Painted Hall, which was itself later replaced. The contents of the State Apartments were rearranged in 2010 to reflect the way they would have looked in the 17th and 18th centuries. In the 1760s, William Cavendish, 4th Duke of Devonshire redirected the approach to Chatsworth. He converted the kitchen in the centre of the north front into an entrance hall from which guests would walk through an open colonnade in the courtyard, through a passage past the cook's bedroom and the back stairs and into the Painted Hall. He then built an neoclassical service wing for his kitchens that were a forerunner of the 6th Duke's north wing. William Cavendish, 5th Duke of Devonshire had some of the family's private rooms redecorated and some partition walls were moved, but there are few traces of the mid- and late 18th century in the public rooms. The 6th Duke conducted many modernisations of Chatsworth House to meet 19th-century standards of comfort, that suited a less formal lifestyle than that of the 1st Duke's time. The corridors around the edges of the courtyard were enclosed and furnished with a multicoloured marble floor, so that rooms could be easily reached from indoors, and more shared living rooms to replace individual guest apartments. The cook's bedroom and the back stairs made way for the Oak Stairs, topped by a glass dome, that were built at the northern end of the Painted Hall to improve internal communications. Along this staircase hang portraits of the first 11 Dukes and some of their family members. The Duke transformed the long gallery, originally created by the 1st Duke, into a library. He was a great lover of books and purchased entire libraries. The Ante-Library in the adjoining room was originally used by the 1st Duke as a dining room and then a billiard room before the 6th Duke used it to house his increasing collection of books. This was just one of the rooms in which the Duke installed a single pane window, which he believed to be the 'greatest ornament of modern decoration'. The window in the Ante-Library is the only one to have been preserved. Much of the scientific library of Henry Cavendish (1731–1810) is in this room. The most notable addition by the 6th Duke to Chatsworth was the Wyatville designed North Wing. Plans for a symmetrical wing to the south were begun but later abandoned. The entire ground floor of the North Wing was occupied by service rooms, including a kitchen, servants' hall, laundry, butler and housekeeper's rooms. On the first floor, facing west, were two sets of bachelor bedrooms called 'California' and 'The Birds.' The main rooms in the new wing face east, and were accessed from the main house through a small library called the Dome Room. The first room beyond this is a dining room, with a music gallery in the serving lobby where the musicians played. Next is the sculpture gallery, the largest room in the house, and then the orangery. The Belvedere Tower contains a plunge bath, using the marble from the 1st Duke's bathroom, and a ballroom that was later turned into a theatre by the 8th Duke. Above the theatre is the belvedere itself, an open viewing platform below the roof. Chatsworth has 126 rooms, with nearly 100 of them closed to visitors. The house is well adapted to allow the family to live privately in their apartments while the house is open to the public. Deborah, Dowager Duchess of Devonshire described the family rooms in detail in her book Chatsworth: The House. She lived at Edensor until her death in 2014, and the present (12th) Duke and Duchess live at Chatsworth. The family occupies rooms on the ground and first floors of the south front, all three floors of the west front, and the upper two floors of the north front. Staircases in the northeast corner of the main block and in a turret in the east front enable them to move about without crossing the public route. The main family living rooms are on the first floor of the south front. The family dining room is in the southeast corner and has the same dimensions as the State Dining Room directly above. This has been the usual location of the family dining room; the Bachelor Duke's dining room in the north wing took over that role for an interlude of little more than a hundred years. Both Bess of Hardwick's house and the 1st Duke's house had a hierarchy of three dining rooms in this corner, each taller and more lavishly decorated than the one below. A common parlour on the ground floor was used by the gentlemen of the household, and later for informal family meals. Above it was the main family dining room, and at the top the Great Chamber, which was reserved for royalty, although the 6th Duke wrote that, to his knowledge, it had never been used. The yellow drawing room, is next to the dining room and directly underneath the State Drawing Room. The Dowager Duchess has written that the house is so solidly built that the crowds passing above are imperceptible. The trio of reception rooms here is completed by the blue drawing room, which is below the State Music Room. This was created in the 18th century by knocking together the 1st Duke's bedroom and dressing room, and has a door to his private gallery at the upper level of the chapel. It has also served as a billiard room and as a school room. Charity events are sometimes held in this part of the house. Both drawing rooms have access to the garden through the South Front's external staircase. Three corridors called 'the Tapestry Gallery', 'the Burlington Corridor' and 'the Book Passage' are wrapped around the south, west and north passages at this level, and give access to family bedrooms. There is a sitting room in the north-west corner — one of the few rooms in the house with outside views in two directions. There are more family bedrooms on the second floor facing west and north. The Scots and Leicester bedrooms in the east wing are still used when there is a large house party, which is the reason why sometimes they are available as a separately charged optional extra in the tour of the house and sometimes they are not. This suite of rooms now contains the 11th Duke's Exhibition. Visitors bypass the first floor on their way down the West Stairs from the state rooms to the Chapel. The private north stairs lead down to more private rooms on the ground floor of the West Front. In the centre is the West Entrance Hall, which is, once again, the family entrance. To the right, on entering, is a passage room known as the mineral room, which leads through to a study. To the left there is the Leather Room; with walls of leather and a great many books this is one of at least six libraries in the house. The next room is the Duke's Study, which has two windows, many more books and floral decoration painted for the Bachelor Duke by, in his own words, "three bearded artists in blouses imported from Paris." The corner room on the ground floor is the former 'little dining room'. These rooms are all very high, as the ground level in the west wing is lower than that of the Painted Hall and the ground floor corridors around the courtyard. Steps from the West Entrance Hall lead up to the west corridor. The other family living rooms are in the eastern half of the ground floor of the South Front and can be reached through the Chapel Corridor on the public route, or the turret staircase from the dining room. The room in the south-east corner was once the Ducal bathroom, until the Bachelor Duke built his new plunge bath in the North Wing, and is now the pantry where the family china is kept. This connects to the modern kitchen, which is under the library and was made out of the steward's room and the linen room. Next to the pantry in the south front are offices. Chatsworth's garden attracts around 300,000 visitors a year. It has a complex blend of different features from six different centuries and covers 105 acres (0.42 km2). The garden is surrounded by a wall 1.75 miles (2.8 km) long. It sits on the eastern side of the valley of the Derwent River and blends into the landscape of the surrounding park, which covers 1,000 acres (4.0 km2). The woods on the moors to the east of the valley form a backdrop to the garden. There is a staff of approximately 20 full-time gardeners. The average rainfall is around 33.7 inches (855 mm) a year, and there are an average of 1,160 sunshine hours a year. Most of the principal features of the garden were created in five main phases of development. The house and garden were first constructed by Sir William Cavendish and Bess of Hardwick in 1555. The Elizabethan garden was much smaller than the modern garden is now. There were terraces to the east of the house where the main lawn is now, ponds and fountains to the south, and fishponds to the west by the river. The main visual remnant of this time is a squat stone tower known as Queen Mary's Bower on account of a legend that Mary, Queen of Scots, was allowed to take the air there while she was a prisoner at Chatsworth. The bower is now outside the garden wall in the park. Some of the retaining walls of the West Garden also date to this era, but they were reconstructed and extended later. The Cascade and Cascade House is a set of stone steps over which water flows from a set of fountains at the top. It was built in 1696 and rebuilt on a grander scale in 1701. In 1703 a grand baroque Temple or Cascade House designed by Thomas Archer was added at the top. A major restoration of both the Cascade and the Cascade House in 1994–1996 took 10,000 man-hours of work. In 2004 the Cascade was voted the best water feature in England by a panel of 45 garden experts organised by Country Life. It has 24 cut steps, each slightly different and with a variety of textures so that each gives a different sound when water runs over and down them. The Canal Pond, dug in 1702, is a 314-yard (287 m)-long rectangular lake to the south of the house. The Seahorse Fountain is a sculptural fountain in a circular pond on the lawn between the house and the Canal Pond. Originally, it was the centrepiece of the main parterre. The Willow Tree Fountain is an imitation tree that squirts water on the unsuspecting from its branches. The writer Celia Fiennes wrote in her diary: "There ... in the middle of ye grove stands a fine willow tree, the leaves, barke and all looks very naturall, ye roote is full of rubbish or great stones to appearance and all on a sudden by ye turning of a sluice it rains from each leafe and from the branches like a shower, it being made of brass and pipes to each leafe, but in appearance is exactly like any willow." The tree has been replaced twice and then restored in 1983. The First Duke's greenhouse is a long, low building with ten arched windows and a temple-like centrepiece. It has been moved from its original site overlooking the 1st Duke's bowling green to the northern edge of the main lawn and is now fronted by a rose garden. Flora's Temple is a classical temple built in 1695 and moved to its present site at the northern end of the broad walk in 1760. It contains a statue of the goddess Flora by Caius Gabriel Cibber. The West Garden—now the family's private garden with modern planting in a three-section formal structure—is mainly a creation of the 1st Duke's time, but the layout is not original. The 4th Duke commissioned the landscape architect, Lancelot "Capability" Brown to transform the garden in the fashionable naturalistic landscape style of the day. Most of the ponds and parterres were converted to lawns, but as detailed above several important features were spared. Many trees were planted, including various American species specially imported from Philadelphia in 1759. The main aim of this work was to improve integration of the garden and park. Brown's 5.5 acre (22,000 m²) Salisbury Lawns still form the setting of the Cascade. The Rockeries and The Strid: in 1842 Paxton began work on a rockery of a gargantuan scale, piling rocks weighing several tons one on top of another. One of them was described thus by Lord Desart in the 1860s: "In one place a sort of miniature Matterhorn apparently blocked the path but with the touch of the finger it revolved on a metal axis and made a way to pass." It is now locked in place to comply with health and safety regulations. Another rock is so balanced that it can be swayed with little pressure. Two rocks are named for the Queen and Prince Albert, and another for the Duke of Wellington, all of whom visited Chatsworth in the 6th Duke's time. The Wellington Rock, a construction of several rocks piled on top of each other, is 45 feet (14 m) high and a small waterfall drips over it into a pond. Sometimes in the winter the water freezes creating icicles. The water flows into a pond created by Paxton called 'The Strid', which is named after a stretch of the River Wharfe on the Devonshires' Bolton Abbey estate, where the river is compressed into a turbulent chasm just a yard wide. Chatsworth's Strid is a placid stretch of water fringed with rocks and luxuriant vegetation and crossed by a rustic bridge. The Arboretum and Pinetum: the 6th Duke's time was an age of plant-hunting expeditions, with major new species readily discovered by intrepid botanists, and the Duke was one of the most generous sponsors. In 1829 he took an additional eight acres (32,000 m²) of the park into the garden to create a pinetum, and in 1835 Paxton began work on an arboretum, which was planned as a systematic succession of trees in accordance with botanical classification. Chatsworth has some of the oldest specimens of species such as Douglas fir and Giant Sequoia in the UK. Also in this part of the garden is the Grotto Pond, which was originally a fishpond, breeding fish for Chatsworth's table. The 6th Duke's mother had had the rustic grotto built at the end of the 18th century. The area around the pond is now planted for autumn colour. The Azalea Dell and the Ravine: Rhododendrons and Azaleas grow well at Chatsworth as the soil suits them, and a section of the southern end of the garden is devoted to them. This is the most rugged part of the garden with steep serpentine paths and a stream running down a small valley known as The Ravine. In 1997 a waterfall was created out of old drinking troughs gathered from fields on the estate. There is also a bamboo walk there. The Emperor Fountain: in 1843 Tsar Nicholas I of Russia informed the Duke that he was likely to visit Chatsworth the following year. In anticipation of this Imperial visit, the Duke decided to construct the world's highest fountain, and set Paxton to work to build it. An eight-acre (32,000 m²) lake was dug on the moors 350 feet (110 m) above the house to supply the natural water pressure. The work was finished in just six months, continuing at night by the light of flares, and the resulting water jet is on record as reaching a height of 296 feet (90 m). However, the Tsar died in 1855 and never saw the fountain. Because of the limited supply of water the fountain usually runs on partial power and only reaches half its full height, but occasionally it is switched to maximum flow. The water power found a practical use generating Chatsworth's electricity from 1893 to 1936. The house was then connected to the mains, and a new turbine was installed in 1988 that produces about a third of the electricity the house needs. The Conservative Wall is a set of greenhouses that run up the slope from Flora's Temple to the stables against the north wall of the garden. A tall central section is flanked by ten smaller sections. They are used to grow fruit and camellias. Two Camellia reticulata 'Captain Rawes' planted in 1850 survive. Chatsworth's camellias have won many prizes. The name of the building has no political connotations; the Dukes of Devonshire were Whigs and later Liberals. The Great Conservatory at Chatsworth. Built from 1836 to 1841 and demolished in 1920. Paxton was responsible, along with architect Decimus Burton, for Chatsworth's Great Conservatory, which began construction in 1836 and was completed in 1841. It was 277 feet (84 m) long, 123 feet (37 m) wide and 61 feet (19 m) high making it the largest glass house in the world at that time and cost £33,099. A carriage drive ran the length of the building between lush tropical vegetation. One W. Adam called it "A mountain of glass ... an unexampled structure ... like a sea of glass when the waves are settling and smoothing down after a storm." The King of Saxony compared it to "A tropical scene with a glass sky." The Great Conservatory was demolished after World War I as all the plants had died as it had not been heated during the war, and the cost of running became too much. Another large glasshouse at Barbrook, on the edge of the park, was devoted to cultivation of the giant Amazon water lily, Victoria amazonica, which flowered in captivity there for the first time. This Lily House has also been lost. The South Front and the South Lawn with the Seahorse Fountain. The exterior steps are a 19th-century replacement for the original horseshoe-shaped steps. The South Lawn limes were double rows of pleached red-twigged limes on either side of the South Lawn, which were planted in 1952 and removed in 2014. The Serpentine Hedge is a wavy hedged yew corridor that leads from the Ring Pond to the bust of the 6th Duke. It was planted in 1953. The Maze was planted with 1,209 yews in the centre of the site of the former Great Conservatory in 1962. Two flower gardens occupy the rest of the site. The Display Greenhouse (1970) is in a modern style, but is unobtrusively sited behind the First Duke's greenhouse. It has three climate zones, tropical, Mediterranean and temperate. Public access is limited but groups may book tours and there are first-come-first-served tours on a few days each season. The Cottage Garden was inspired by an exhibit at the 1988 Chelsea Flower Show. A front garden of flower beds bordered by box leads to the "kitchen/dining" room with furniture covered with plants. There is a bedroom in the same style on the upper level. The Kitchen Garden is a productive fruit and vegetable garden with decorative features. It was created behind the stables in the early 1990s. Chatsworth's original kitchen garden covered 11.5 acres (5 ha) and was by the river in the park. Revelation is a sculptural fountain designed by the sculptor Angela Conner and installed in 1999. This was the only modern water feature to make the top ten of the Country Life poll mentioned above. Modern sculpture includes various pieces, such as War Horse and Walking Madonna by Dame Elizabeth Frink, and 14 bronze portrait heads by Angela Conner. The Sensory Garden is fully accessible to the disabled and features many fragrant plants. It was opened in 2004 by the then Home Secretary David Blunkett. Quebec is a 4-acre (16,000 m2) part of the garden to the south and west of the canal pond that was, until 2006, a neglected and dank area covered with Rhododendron ponticum. This is now an extension to the Arboretum walk with a path that runs along the top of the steep bank. The new walk gives views out into the south park, across the River Derwent and up the hill towards New Piece wood. An 18th-century cascade was uncovered during the clearance. The stable block at Chatsworth is prominently situated on the rising ground to the north-east of the house. Its entrance gate features four Doric columns with rusticated banding, a pediment containing a huge carving of the family coat of arms, two life-size stags in embellished with real antlers, and a clock tower topped by a cupola. The building was designed by James Paine for the 4th Duke and was built in around 1760. It is approximately 190 feet (60 m) square and is two storeys tall. There are low towers in the corners in addition to the one over the entrance gate. The stables originally had stalls for 80 horses, and all necessary equine facilities including a blacksmiths shop. The first floor was occupied by granaries and accommodation for the many stable staff. According to the Dowager Duchess in her book, Chatsworth: The House, one room still has "Third Postillion" painted on the door. The 6th Duke added a carriage house behind the stables in the 1830s. The last horses left the stables in 1939 and the building was then used as a store and garage. The grooms' accommodation was converted into flats for Chatsworth employees and pensioners and their families. When the house reopened to the public after the war, "catering" was limited to an outdoor tap, which has since been relabelled "water for dogs". In 1975 a tea bar was established with an investment of £120. The first attempt at a café opened in 1979. It seated 90 in some old horse stalls in the stables and was not satisfactory; either to the customers or from a commercial point of view. In 1987 the Duke and Duchess's private chef, a Frenchman named Jean-Pierre Béraud who was also a leading light in the success of the Chatsworth Farm Shop and Chatsworth Foods, took charge of the catering. After a failed attempt to obtain planning permission for a new building incorporating the old ice house in the park, a 250-seat restaurant was created in the carriage house. The 19th-century coach used by the Dowager Duchess and the late Duke at the Queen's Coronation is on display there. Other facilities include The Cavendish Rooms, which also serves refreshments, a shop and three rooms available for hire. The stables cater for thirty thousand people a month during the visitor season. Chatsworth's park covers about 1,000 acres (4.0 km2) and is open to the public free of charge all year-round, except for the south-east section, known as the Old Park, which is not open since it is used for breeding by the herds of red and fallow deer. The attitudes of the Dukes regarding wider access rights have changed significantly over the years. Upon his death, in 2004, the Ramblers Association praised the 11th Duke for his enlightened championing of open access, as well as his apologies for the attitude of the 10th Duke, who had restricted access to much estate land. Even during the 11th Duke's tenure, however, disputes arose—when the definitive rights of way were being compiled in the 1960s and 70s, the footpath to the Swiss Cottage (an isolated house by one of the lakes in the woods) was contested, and the matter went to the High Court, making Derbyshire one of the last counties to settle its definitive maps. Farm stock also graze in the park, many of which belong to tenant farmers or smallholders, who use the park for summer grazing. Bess of Harwick's park was entirely on the eastern side of the river and only extended as far south as the Emperor Fountain and as far north as the cricket ground. Seven fish ponds were dug to the north-west of the house, where the large, flat area used for events such as the annual Chatsworth Horse Trials and the Country Fair, that is typically held towards the end of August, is now. The bridge across the river was at the southern end of the park and it crossed to the old village of Edensor, which was by the river in full sight of the house. Capability Brown did at least as much work in the park as he did in the garden. The open, tree-flecked landscape that is admired today is man-made. Brown straightened the river, and there is a network of drainage channels under the grass. The park is fertilised with manure from the estates farms and managed to keep weeds and scrub under control. Brown filled in most of the fishponds and extended the park to the west of the river. At the same time James Paine designed the new bridge to the north of the house, which was set at an angle of 40 degrees to command the best view of the West Front of the house. Most of the houses in Edensor were demolished, and the village was rebuilt out of sight of the house. The hedges between the fields on the west bank of the river were grubbed up to create open parkland, and woods were planted on the horizon. These were arranged in triangular clumps so that the screen of trees could be maintained when each planting had to be felled. Brown's plantings reached their peak in the mid-20th century and are gradually being replaced. The 5th Duke had an elegant red-brick inn built at Edensor to accommodate the increasing numbers of well-to-do travellers who were coming to see Chatsworth. It is now the estate office. In 1823 the Bachelor Duke acquired the Duke of Rutland's land around Baslow to the north of Chatsworth in exchange for some land elsewhere. He extended the park around half a mile (800 m) north to its present boundary. He also had the remaining cottages from the old Edensor inside the park demolished apart from the home of one old man who did not wish to move, which still stands in isolation in the park today. The houses in Edensor were rebuilt in picturesque pattern-book styles. In the 1860s the 7th Duke had St Peter's Church, Edensor enlarged by Sir George Gilbert Scott. The church's spire embellishes the views from the house, garden and park, and inside there is a remarkable monument to Bess of Hardwick's sons Henry Cavendish and William, 1st Earl of Devonshire. St Peter's in Edensor is also where the 6th, 7th, 8th, 9th, 10th and 11th Duke of Devonshire and their wives are buried. Their remains are not entombed in a vault inside the church but lie, marked by simple headstones, in individual graves in the Cavendish family plot overlooking the churchyard. On the hills of the eastern side of the park there is Stand Wood, where the Hunting Tower is located, that was built in 1582 by Bess of Hardwick. At the top of Stand Wood there is a plateau covering several square miles by lakes, woods and moorland. There are public paths through the area and Chatsworth offers guided tours with commentary in a 28-seater trailer pulled by a tractor. This area is the source of the water for all the gravity-fed waterworks in the garden. The Swiss Lake feeds the Cascade and the Emperor Lake feeds the Emperor Fountain. The Bachelor Duke had an aqueduct built, over which water tumbles on its way to the cascade. The late Deborah, Dowager Duchess of Devonshire, was a keen advocate of rural life, and in 1973 the Chatsworth Farmyard exhibit was opened in the old building yard above the stables. The aim was to explain to those unfamiliar with rural life how food was produced. There are milking demonstrations and displays of rare breeds. An adventure playground was added in 1983, and a venue for talks and exhibitions called Oak Barn was opened by television gardener Alan Titchmarsh in 2005. Chatsworth also runs two annual rural-skills weeks during which demonstrations of agricultural and forestry are given to groups of schoolchildren on the estate farms and woods. The Main Estate is a compact block of 12,310 acres (4,982 ha) around the house, including the park and many properties in the villages of Baslow, Pilsley, Edensor, Beeley, and Calton Lees. The West Estate is 6,498 acres (26.30 km2) of scattered high ground, mostly in the Peak District and partly in Staffordshire. Hartington, from which the family takes its secondary title is nearby. The Shottle Estate is 3,519 acres (14.24 km2) in and around Shottle, which is around 15 miles (24 km) south of Chatsworth. This is low-lying land and is home to most of the dairy farms on the estate, and also has some arable farms. 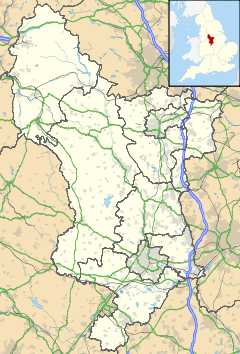 The Staveley Estate is 3,400 acres (14 km2) at Staveley near Chesterfield, including a 355 acres (1.44 km2) industrial site called Staveley Works, which is let to various tenants, some woodlands, and arable farms. The Scarcliffe Estate, mostly arable farms, is 9,320 acres (37.7 km2) east of Chesterfield. The Chatsworth Settlement has a wide range of sources of income in addition to agricultural rents. Several thousand acres of the estate, mostly around Chatsworth and on the Staveley estate, are farmed in hand. A number of properties may be rented as holiday cottages, including Bess of Hardwick's Hunting Tower in the park. Several quarries produce limestone and other minerals. The 11th Duke and Duchess did not opt for the "theme park" approach to modernising a country estate, but they did throw off the traditional aristocratic reluctance to participate in commerce. The Chatsworth Farm Shop is a very large enterprise in the UK, employing over a hundred people. A 90-seat restaurant opened at the farm shop in 2005. From 1999 to 2003 there was also a shop in the exclusive London district of Belgravia, but it was not successful and closed down. The Settlement also runs the four shops and the catering operations at Chatsworth, paying a percentage of turnover to the charitable Chatsworth House Trust in lieu of rent. It also runs the Devonshire Arms Hotel and the Devonshire Fell Hotel & Bistro on the Bolton Abbey estate and owns the Cavendish Hotel at Baslow on the edge of Chatsworth Park, which is let to a tenant. The old kitchen garden at Barbrook on the edge of the park is let to the Caravan Club, and a paddock at the southern end of the park where bucks used to be fattened for Chatsworth's table is a tenanted garden centre. In both cases the Settlement receives a percentage of turnover as rent. There is also a line of Chatsworth branded foods, endorsed with the Dowager Duchess's signature, which is available by mail order. The Dowager Duchess has also established Chatsworth Design to exploit intellectual property rights to the Devonshire collections, and a furniture company called Chatsworth Carpenters, but the latter has now been licensed to an American company. Pride and Prejudice (1813) – The house itself is named in the novel as one of the estates Elizabeth Bennet visits before arriving at Pemberley. Barry Lyndon (1975) – Chatsworth House represented Castle Hackton. The Bounty (1984) – Two rooms in Chatsworth House represented two rooms in Admiralty House. Interceptor (1989) – An episode was partially filmed on the grounds as the key was hidden on the top of the Cascade waterwork. Pride & Prejudice (2005) – Represented Pemberley, Mr Darcy's home in the film adaptation. On 9 July 2006, the Irish vocal pop band Westlife held a concert for their tour in support of their album Face to Face. Rivers with Griff Rhys Jones (2009) – Griff Rhys Jones was a guest at Chatsworth while making and filming his show. Chatsworth (2012) – Chatsworth House was the subject of a three-part documentary on BBC television. The series was broadcast as Chatsworth House in the United States by PBS. "Breathless Beauty, Broken Beauty" (2014) – Chatsworth featured in the world's first 12K (3 × 4K) video sculpture, displayed at the Victoria and Albert Museum. The Crown (2016) – A large room was used to represent the interior of Buckingham Palace during a conversation between Queen Elizabeth II, the Queen Mother, and the courtier Tommy Lascelles about the royal repercussions of Princess Margaret's affair with Peter Townsend. Certain scenes from series 2 of Peaky Blinders were filmed at Chatsworth. ^ a b Historic England. "Chatsworth House (Grade I) (1373871)". National Heritage List for England. Retrieved 16 June 2016. ^ "Chatsworth Receives Top Honour in Prestigious NPI National Heritage Awards". Prnewswire.co.uk. Retrieved 21 June 2012. ^ "bbc: Award boosts stately home visitors". BBC News. 25 August 2003. Retrieved 21 June 2012. ^ a b Hall, Rev. George (1839). The history of Chesterfield: with particulars of the hamlets contiguous to the town and descriptive accounts of Chatsworth Hardwick and Bolsover. London: Whittaker and Co.
^ Thompson, Francis (1949). "1". A history of Chatsworth: being a supplement to the sixth Duke of Devonshire's handbook. Country Life. p. 21. ^ Digby, George Wingfield (1964). Elizabethan Embroidery. Thomas Yoseloff. pp. 58–63. ASIN B0042KP67G. ^ "Cavendish, William (1617-1684)" . Dictionary of National Biography. London: Smith, Elder & Co. 1885–1900. ^ a b c Your Guide to Chatsworth. Streamline Press Ltd. 2012. ISBN 978-0-9537329-1-3. ^ Chaves, José Joubert, ed. (5 December 1904). "Viagem Real — Os Reis de Portugal Sob a Nevada em Chatsworth" [Royal Trip — The King and Queen of Portugal under the Snow in Chatsworth]. Illustração Portugueza (in Portuguese). Lisbon. Archived from the original on 4 March 2016. Retrieved 7 August 2014. ^ Peak District Online Retrieved 24 September 2014. ^ "Chatsworth House £32m restoration unveiled". 24 March 2018. Retrieved 24 March 2018. ^ Tomlinson, Lucy (11 October 2012). "Inside Chatsworth House". Britain Magazine. ^ Anon. "Chatsworth House". tour K. Just Tour Ltd. Retrieved 3 September 2010. ^ "Chatsworth – photo library". Web.archive.org. 28 September 2007. Archived from the original on 5 July 2008. Retrieved 21 June 2012. ^ Dorment, Richard (17 March 2010). "Chatsworth House: a masterpiece in every room". The Telegraph. ^ "Chatsworth's Cascade is the best in England". Web.archive.org. 28 September 2007. Archived from the original on 20 July 2008. Retrieved 21 June 2012. ^ Emperor Fountain goes sky high, Chatsworth press release, 25 April 2007. ^ "Hidden Gems Walking Tour" (PDF). Chatsworth Estate. Retrieved 22 August 2013. ^ "Chatsworth Country Fair". Chatsworth Country Fair. Retrieved 5 September 2012. ^ "unknown". Archived from the original on 3 March 2009. Chatsworth:A Short History (1951) by Francis Thomson (librarian and keeper of collections at Chatsworth). Country Life Limited. Wikimedia Commons has media related to Chatsworth House.